Haunted Tombstone Arizona is considered to be one of the most popular real haunted places in America. When it comes to haunted Arizona, nearly all individuals think of the ghost town known as Tombstone before any other haunted location. This city has a long list of violent historical notations. The stories that surround this particular region contribute to the legendary hauntings that the city is known for. The history of this city is so important to the locals that you will see a large assortment of handmade signs that explain particular events in certain locations. In this haunted places to go ghost town guide, you will learn many interesting facts pertaining to haunted Tombstone. The city of Tombstone was established in the year of 1879 on the 5th day of March. This name was chosen by a popular prospector of the time named Edward Schieffelin. This man and a large group of scouts identified as Hualapai ventured into the region in the year of 1877. This man was known for his appearance. He was a rugged old looking male that was just under thirty years old. His build displayed power and simple ferocity. He took a great pride in his career as a prospector, typically working from early morning to late night each and everything single day. Unfortunately, his attempt at prospecting rarely allowed him to experience the excitement of being successful. That is, until one day, he successfully discovered silver ore. Many of the people of the area often made fun of him because he elected to prospect in the area that is known today as Tombstone Hills. He also spent a large amount of time in the area that is now known as Mule Mountains. One day, he was approached by a soldier with a vast amount of curiosity. He asked Schieffelin why he chooses to prospect in the area that he did. He informed the soldier that he was seeking out rocks. The soldier replied with: “You keep fooling around there amongst them Apaches and the only rock you’ll find will be your tombstone!” This was said because of the fact that most individuals that searched the area he searched had never returned home. When the prospector discovered the silver ore, he thought on what the soldier had told him. The name “Tombstone” immediately came to mind. He decided to name the area that he discovered as Tombstone. Eventually, it would come to pass, that the area was literally sitting on a mine of riches. Eventually, a city was established on the top of mesa that was flat and surrounded by many mountains. In just two years of establishment, the city’s population exceeded five thousand individuals. Now that you have learned a little about the city and how it was established, it is time to explore the haunted Tombstone. There are many ghosts that are said to be a part of haunted Tombstone Arizona – one of the most famous real haunted places of America. The first area of the city that is considered to be haunted is also the single most popular location in the entire city. This establishment is identified as the OK Corral. This is the location where the famous gunfighter Wyatt Earp participated in the most famous gunfight in all of history. He went up against the group that is often referred to as the “Cowboy Faction”. Located on Allen Street, many cowboys lost their lives in this location. 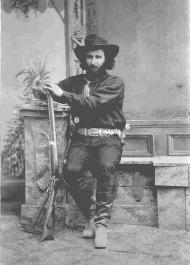 Throughout history, many claim that they have seen the apparitions of cowboys in the OK Corral in a gun fighting stance. The next haunted place in the city of Tombstone is the Boothill Graveyard. There are approximately two hundred fifty different tombstones for those that “died with their boots on”. Many different individuals are believed to reside in this region of haunted Arizona after death. Individuals that were part of the famous gunfight in the OK Corral are buried in this cemetery. These individuals include Marshal White, Luke Short, Charlie Storm, and many others. Individuals that visit the graveyard often state that they see and hear the apparitions of these men. 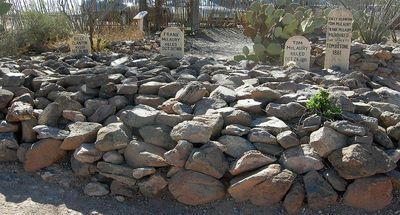 One of the men that are buried in this area named Billy Clanton is believed to walk from the graveyard to Tombstone regularly. Many have reported seeing unusual lights. There are others that claim to hear unusual sounds for which no culprit may be identified in this location. The Bird Cage Theatre is a main attraction when it comes to haunted Tombstone Arizona locations. Since the era of the 1800s, the socially elite have gathered at this particular location for many different social functions. The establishment had several different types of entertainment. The theatre was in place, as well as a saloon. In addition to these rooms, there was also a room dedicated to gambling. The combination of the Old West, booze, gambling and gun fighting proved to have a detrimental effect on the population of the area from the years of 1881 to 1889 as nearly thirty individuals were murdered within this building. Fortunately, it seems as if the spirits that reside in this building are only out for a good time as many claim that they are not frightening, but extremely playful. In the year of 1921, an educational facility for children was established directly across from the haunted Bird Cage theatre. As a result, children and adults alike were often in direct vicinity of the building – which was then vacant. Many complaints and reportings were documented where individuals often stated that it sounded as if people were partying inside the structure. When local law enforcement officers arrived, they always found the building to be completely empty. When it comes to haunted Tombstone Arizona, the Bird Cage Theatre is considered to be one of the most haunted places in all of the state. As you can see, there are many types of unexplained phenomenon that is said to occur in haunted Tombstone Arizona. It is believed that these hauntings stem from the historical past of the Old West and the violence that occurred during that era. If you are interested in real haunted places in America or simply enjoy soaking up the history of the Wild West, Tombstone Arizona is a hot spot for historians and ghost hunters alike. By visiting here, you may catch a glimpse of a gun fighting ghost, a flash of light that cannot be explained, or you may hear the sounds of a ghostly socially elite party occurring.